Just as every 4 out of 10, our today’s inspiration never really liked school much because of its authoritarian nature. “School wasn’t fun but I will never forget my first history class lesson when our teacher wrote in big block letters on the black board; “HISTORY IS WINNERS’ HISTORY”- that had shaken a part of me.” – Jari Kuosma, the original developer of Modern and commercial wingsuit and the owner of Birdman International ltd.
Jari Kuosma is professional skydiver, innovator and designer. He is known as the pioneer of wingsuit flying and chief designer of the products that carry his registered brand name BIRDMAN®. 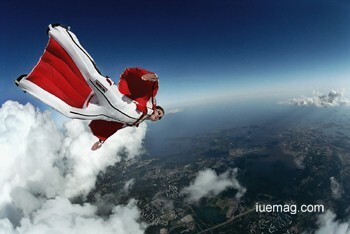 Birdman was the first company ever to produce wingsuits for skydivers. “The idea of the modern and commercial wingsuit came to him on the cliff of Monte Brento in Italy where he was B.A.S.E. jumping with his friends. “The local jumpers there told us about a legendary French skydiver Patric DeGayardon, (who had been my “skygod” since I was a novice jumper) who had been on that same cliff and flown his selfmade wingsuit off it. It was then when I saw the possibilities and it helped because I had my first team, Robert, Irene and Stane right there with me, although they didn’t know it just yet!” he smiles. Some good memories that he lives with are from his youth about playing “indians & cowboys” with his brother and friends at their summer place in the middle of Finland, skiing with family in Lappland. “In 1989 I booked a parachuting course for me and my brother. My brother did it and although he had told me how cool it was to skydive I had no idea what I was getting into. I had a mindset that I would make just one jump, to prove myself or just to have an experience. The skydiving course at Parachuting Club of Finland was conducted an “old school” way which was great. My mind-set was changing for sure and when I was finally, after one week of training, getting ready to make my first jump I was scared stiff! But I did it! I had conquered the death in mind, I had calculated right and what a liberating and totally free feeling that was, something I had never experienced in my life before; Freedom! I was free only for about 0.5 seconds, then the parachute violently stopped my fall, my body started working on figuring out whether the parachute was flying or not while my mind was screaming YYAAHHOOO! That jump changed my life,” how could this stop him from laughing while describing? “One can enter another realm what I call the Zone. It’s a place where you have almost limitless possibilities to play and create new things. I love the most about flying in my wingsuit ,immensely fast, is when nothing is planned, when you just jump out and decide where you fly and how, as you go. Wingsuit makes this escape possible and new possibilities excite me the most,” was his view of the adventure and enjoyment of his life. BirdMan has a pioneering and a historical aspect to it, it is a synonym for wingsuit flying and therefore Jari thinks that it is his honour and duty to create and explore new ideas and technologies in order to make the most exciting wingsuits and thus a flying experience, that are tecnically possible given the resourses. He has long seen a vision, the potential for BirdMan brand to raise above the common skydiving market segment and perhaps give inspiration for people who long for freedom. He feels extremely grateful to an incredible bunch of people from all walks of life and who conquer fear every time they jump. He jumps because of all the other beautiful and brave people who share this sport in so many different ways and make it all possible. He then shared one of the most memorable experiences happened in Venezuela. He was hired to teach novice skydivers at the drop zone near Angel Falls. One of their Generals had been in Finland in his youth in ‘60’s and once he learned that Jari belonged to Finland, they became friends. “He asked me to look after some of his Green Barets in free fall, since “they had some trouble, due to lack of training” and I ended up chasing them across the sky, after they lost control in the free fall. It was a very scary situation but I managed to stop their spin and pulling their parachutes for them which earned me their Special Forces “medal of honor”, a tigers sharks toot with implanted river pearl. It was the most proud moment in my life. Later on I found out that this same general left a son, named as Jari, in Finland. I connected with his son after I returned to Finland 6 months later,” Jari Kuosma proudly narrates. He found the love of this life and has worked to nurture it well. Jari has over 5000 parachute jumps of which 4000 are with wingsuits. He has designed 15 commercial wingsuits, a premium watch collection and co-designed two clothing collections till date. Jari has appeared in TV & Documentary films and performed numerous times as a stunt jumper for live shows and stunts for a film. Jari is also the author of the Wingsuit First Flight Course and the BIRDMAN Wingsuit Instructor Course; methods to teach skydivers how to fly safely with wingsuits who have eventually become certified wingsuit pilots & instructors. “Sometimes I put a business suit, sometimes a wingsuit and sometimes no suit at all,” he laughs. “Love life. Be yourself and trust yourself. Love everybody and give everybody a change, including yourself. Move on when you need to and stop worrying and planning all your life, it rarely goes as planned. Take care of your body, it truly is your temple. Have a passion and follow it, change when needed. Never listen to nay sayers unconditionally, but learn from them and try to listen more than arguing with them, it’s amazing what you can learn from even the smallest thing. Finally, don’t be afraid – ever,” were Jari’s inspiring words. Any facts, figures or references stated here are made by the author & don't reflect the endorsement of iU at all times unless otherwise drafted by official staff at iU. This article was first published here on 23rd December 2014.